“Ficelle” (pronounced fee-sell) opened in 2005 and is a short one block walk from the Abbey House Inn. Inspired by our mother (and her friends), grandmother, and friends’ mothers’ way of enjoying life and people, we opened Ficelle with the idea of recapturing that feeling of hospitality and community…and we are constantly evolving in that effort. Though we serve tapas (or small plates), and tapas originated in Spain, our menu is not limited to one type or style of cuisine. We incorporate food from our Spanish heritage, the Mexican & California cuisines prevalent in Winters, and any other type food that seems interesting that crosses our paths. 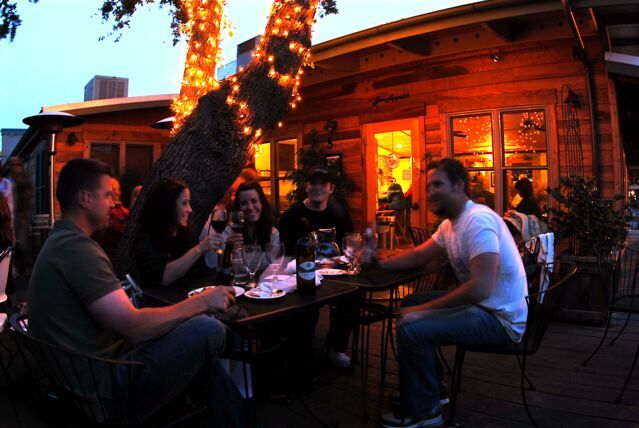 No matter what type of food we’re serving we will say that you’ll feel at home while savoring a great meal in our casual and relaxed dining room or under the oak tree on our patio. Though our tapas are not traditional, for us it’s all about an authentic Spanish lifestyle: coming together with family and friends for delicious food and drink, laughter, and conversation. Experience our inventive cuisine in a friendly atmosphere; come see what makes us one of the most popular restaurants in town, and why Ficelle has been voted the “best tapas in the Sacramento area” for two years in a row.